Red pot Jacob Svrcek shoulders his axe handle while watching the Student Bonfire burn in Robertson County on Friday night. The Aggies won't get to "beat the hell outta t.u." this year, but that didn't stop thousands from turning out for Student Bonfire . For the first time, tradition-rich Texas A&M set ablaze a towering stack of logs on Friday in advance of a football game that won't involve longtime rival the University of Texas. It was the first bonfire held since the Aggies left the Big 12 for the Southeastern Conference. Gone was the anti-Texas paraphernalia, and the bonfire , typically held on Tuesdays, was moved to the Friday after Thanksgiving. A stuffed tiger was sacrificed atop the five-story-high flames to represent Saturday's regular season-ending game against fellow SEC newcomer Missouri. An outhouse with "Mizzou tiger cage" painted across the side adorned the top of the structure. But staying true to tradition, wood crackled, smoke swirled and Aggies whooped. The Student Bonfire was staged off of Old Hearne Road in Roberston County after being postponed for two years because of the drought and burn bans. The festivity has been student-run since 2002; the officially sanctioned on-campus event was suspended after the 1999 Bonfire collapse that killed 12 people and injured 27. "Our move to the SEC has been really big," said Drew Nolan, an event organizer. "I think it's brought a lot more attention to the university and, by proxy, even though we're in no way associated with Texas A&M, it's brought a lot of attention to us. 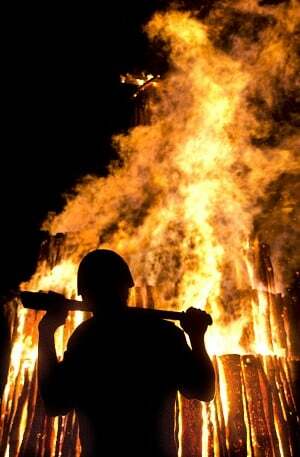 Because people think of A&M, and they think of traditions, and bonfire is a really big part of that." Nolan is a "red pot," one of the handful of top-ranked student organizers marked by red helmets. He said students had worked on cutting trees and constructing the bonfire since September. This year's incarnation was approximately 45 feet high and consisted of about 1,300 logs, he said. The fourth-year participant said he wasn't worried about this year's changes. "t.u. may have helped start the rivalry way back in the day, but we're not going to let them end it," Nolan said. "A&M is in the midst of a lot of change -- there's new traditions and new rivalries. I know it's counterintuitive for Aggies, but things are changing at Texas A&M. Change can be good, but at the same time, part of what makes A&M great is that it stays consistent. Bonfire , I feel, is part of that consistency." Deborah Matern, class of 1989, watched the festivities from the sidelines, surrounded by friends and family. "The camaraderie the school instills is amazing," Matern said. "Being an Aggie and being a part of this is unlike anything else I've ever been a part of." Daniel Sharp, who graduated from A&M in May, shared a similar sentiment. "It's deeper than just to beat Texas -- it's the burning desire to be an Aggie," Sharp said. "And it's a big fire, and everybody likes to see it." David Reynolds, class of 1964, has helped with the bonfire since 1986. He traditionally provides semi-trucks to transport the trees but said he also "fills in the gaps" where needed. "Harking back to the '80s, at that time the student leadership by this time in the evening [7:30 p.m.] was so drunk they could hardly function. And now the bonfire is non-alcoholic," Reynolds said. "They have really made an effort at safety, and perhaps that is the single biggest thing that I can pick out [that's changed]. Reynolds has watched the event morph throughout the decades and doesn't expect the loss of the Texas game to dampen the Aggie spirit. "It is as much an A&M tradition -- and A&M is knee-deep in traditions -- as anything else," Reynolds said. "As an older Aggie, I wish we were still playing the university [of Texas], but unfortunately it's not there. But I don't think we'll lose our tradition. I think we'll find somebody to beat the hell out of."